“I feel a rumblin’ in her ground,” Neil Young sang, alone onstage at Avery Fisher Hall, playing his Gretsch White Falcon, sounding the low notes of a strummed chord, muting them a little with the heel of his hand. The song was generally about planet earth but could have been specifically about where he stood. As he struck those low notes, the metal fixtures in the room talked back: the exit signs, the lighting plates and possibly the balcony railings all rattled like rivets in a cymbal. Mr. Young has done solo tours before. They usually involve acoustic guitars, beat-up pianos and contemplative looks at his instruments between songs. They’re fine. But his current tour connects to a recent record, “Le Noise,” which makes songwriting secondary to sound. And then the full effect. It wasn’t much to look at. He switched off between his usual instruments, the White Falcon and a black Gibson Les Paul, through two Fender deluxe amplifiers. Playing “Down by the River,” he flipped his guitar’s selector switch up and down between verses and choruses. Occasionally he hit a pedal to engage a slow and subtle phase effect. That was all, or at least all you could see. The reverb — in the amplifiers, not in the room — took on an extraordinary quality, as if the implied space in the music became a little more real. The sound seemed giant-size but not painful: it didn’t fire at you, it enveloped you. Mr. Young’s shows generally suggest sophisticated thinking about frequencies and pain thresholds, but this was something else again. There were keyboard instruments onstage, too: worn spinet and baby-grand pianos, and a pump organ. Presumably, he’s carrying them around the country; he played them for one song each. (At the spinet, he performed a plinky new song, “Leia,” about adults watching a child playing: “Captured falling leaves from the branches of the music tree/She’s a baby with a drum making music that the soul can see.”) These were pauses between deep draughts of guitar, where the concert’s action lay. little walk/out on the land/When we’re just walkin’ and holdin’ hands/You can take it as a sign of love” — he bared his teeth and looked ready to bite. One of the great pleasures of experiencing Neil Young live is the fact that he’s still a wild card, still hungry to forge ahead. No matter how well you know his songs, it’s never clear how Young, at a restless 65, will interpret them on stage the night you’re hearing him. Over the past few years, his concerts in the Boston area have varied from acoustic showcases to rafter-rattling rock spectacles that make you wonder how he does it. At the Citi Wang Theatre last night, for the first of his two consecutive performances there, Young offered both sides of his artistry. Opening with a trio of heavy-hitters (“Hey Hey, My My (Into the Black),’’ “Tell Me Why,’’ “Helpless’’), Young eased into the night on acoustic guitar and harmonica before the electric deluge (“Down by the River,’’ “Ohio’’). Young is on the road behind last year’s “Le Noise,’’ a spectral solo album produced by Daniel Lanois. His stage setup — just Young with an assortment of guitars, two pianos, and a pipe organ — reflected that directness. Played with various effects on his acoustic guitar, the new songs (“Love and War,’’ “Peaceful Valley Boulevard’’) resonated with a metallic warmth. At times, his performance cut so close to the bone, it sounded like some of his live recordings that captured Young playing to coffeehouse crowds in the late ’60s. Bert Jansch, the revered Scottish guitarist, singer, and songwriter whose disciples include everyone from Young to Jimmy Page, opened the show in a similarly stark fashion. Armed with an acoustic guitar — and sometimes it really did sound like a weapon — Jansch summoned the pathos of a man who has lived the hard times he salutes in song. The typical history of rock’n’roll in America neither begins nor ends with Neil Young. But with his solo work, ranging from country-flavored to garage-band grunge, and as a member of seminal groups such as Buffalo Springfield and Crosby, Stills, Nash and Young, his five decades of singing and songwriting have earned him not just induction into the Rock’n’Roll Hall of Fame but recognition as one of the genre’s most influential voices. Young celebrated his 65th birthday in November, and the cuts on his latest, 2010’s “Le Noise,” lack the staying power or just plain power of his most memorable work. But despite the lack of recent groundbreaking activity, the native of Canada is still relevant enough to entice an almost capacity Landmark Theater crowd to shell out as much as much as $200 apiece for Sunday night’s show. In the second stop on his spring tour, Young sauntered onstage decked out in a cream-colored jacket and fedora and was greeted with a standing ovation. DURHAM — You just never know what you’re going to get when Neil Young comes to town, because he has multiple guises to choose from. There’s the folksy acoustic troubadour at one end, the noble-savage electric-guitar savant at the other, and numerous shades in between. For his latest tour, which opened at the Durham Performing Arts Center Friday night, Young has chosen a typically idiosyncratic course: performing all of them, or at least as many as he could fit into a 90-minute set, as a one-man band. The songs chosen pretty much covered his primary obsessions, with the obligatory references to native Americans, mother nature and whether or not somebody just told a lie. 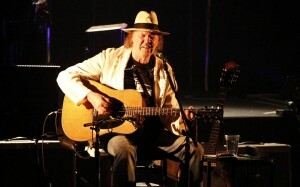 Following a mellow, enjoyably drowsy 40-minute opening set by British folk-rock notable Bert Jansch, Young came onstage in a white jacket and fedora, looking as if he’d just stepped off the cover of his latest album “Le Noise.” Then he sat down, picked up an acoustic guitar and started with three chestnuts the sold-out crowd had come to hear: “My My, Hey Hey (Out of the Blue),” “Tell Me Why” and “Helpless.” Between the apocalyptic tone of the minor-key guitar riff, Young’s atmospheric harmonica and his haunting-as-ever cracked whine, “My My, Hey Hey” was particularly effective. But just as everyone was settling in, possibly hoping against hope for a greatest-hits set of nothing but the old classics, Young changed gears. For the rest of the set, Young alternated between acoustic and electric guitar, two different flavors of piano (upright and baby grand) and even pump organ. Between songs, Young would wander about the stage, as if trying to decide which one he wanted to play next. One interesting aspect of this approach was that you got a sense of the threads that make up Young’s whole, and connections between his acoustic and electric sides. At times in the past, those have seemed more like separate warring factions than parts of a unified whole. But presented in this way, with no extraneous bandmates or instrumentation, Young’s electric and acoustic sides didn’t seem so different. Of course, the show wasn’t perfect. It could have been longer, for one thing, because it wrapped well before the customary 11 p.m. stopping time after just an hour and a half. For another, if Young was going to play that short a set, he could have done a few less songs off “Le Noise” and a few more from the more obscure corners of his catalog. “Le Noise” isn’t bad, and it has at least one remarkable song in “The Hitchhiker” — a back-pages rumination of Young’s own long strange trip with vintage-classic lyrics (“Smokin’ grass as the summer passed/In a real organic scene”). Still, it’s not like people were leaping to their feet to give the “Le Noise” material standing ovations. No, the songs they were excited to hear were “Down by the River,” with its maelstrom of electric guitar; “After the Gold Rush,” with the reference to “1970s” updated to “21st century”; and most especially “Ohio,” which still sounds up-to-date without any rewriting to speak of. Other highlights included “Cortez the Killer” and “Cinnamon Girl.” For the encore, Young broke out the “Le Noise” song “Walk With Me,” and he closed by waving his guitar in front of the onstage amplifiers to induce feedback drones. That’s a trick Young probably learned from touring with Sonic Youth 20 years ago. But he still made it seem brand new. Great songs work like Rorschach Tests. Creative-types can see anything they want in them. And the pieces reveal just as much about the viewer as they do about the artist. By that measure, Neil Young’s songs provide the widest possible range of interpretations. That made him a perfect subject for the Thursday night’s all-star tribute show curated by Michael Dorf, of City Winery and the Knitting Factory fame. The show, which took place as many in Dorf’s series have, at Carnegie Hall, featured a familiar range of New York-centric interpreters, from Patti Smith, Bettye LaVette, and Joan Osborne to Evan Dando, Pete Yorn, and The Roots. Yet, it also found room in its 22 star line-up for artists like the U.K.’s Ben Ottewell (of the band Gomez), Ireland’s Glen Hansard (of the movie “Once”) and Brazil’s Bebel Gilberto. For nearly a decade, Dorf has produced these shows, which benefit a number of music education programs. Past subjects have included Dylan, Joni Mitchell, Springsteen, The Who and Simon & Garfunkel. While Young presents a particularly wide catalogue of material to choose from, Thursday’s interpreters stressed early Neil. All but five pieces were recorded between 1968 and ’78. Also, the stars greatly favored Young’s singer-songwriter mode over his freak-out guitar hero guise with Crazy Horse. The show presented its time bias early. All three of the opening songs came from 1972’s “Harvest,” Young’s most commercially-potent work. While Joe Purdy and Joan Osborne performed “Out on The Weekend” and “Old Man” faithfully (and uninterestingly) Bettye LaVette brought a profound part of herself to “Heart of Gold.” To be fair, there’s a bit of a cheat to that. LaVette first recorded the song back in ’72. As is her wont, she turned the song from a folk piece into a gospel/soul barn-burner. Leaning into the chorus, she greatly expanded the range of the vocal, added a southern funky piano, and, together, made this once meditative song a desperate cri de coeur. Few singers performed as radical a rethink, though even some minor fiddling showed the songs in a telling new light. Keller Williams kept the wonderful melody of “Comes A Time” but sped up the pace and added witty rhythmic flourishes. Glen Hansard lent significant new drama to “Tell Me Why,” not by changing the arrangement but by singing at a slight distance from the mike. It drew the listener in and gave a poignant new sense of strain. Nada Surf fluffed up the melody of 1975’s “Barstool Blues,” treating it as The Byrds might early Dylan, while Ben Ottewell added a soul vibe to one of the few newer songs, 1992’s “Unknown Legend.” Pete Yorn hedged his bets by offering two takes on “Rockin’ In The Free World” – one wounded and slow, the other triumphant and fun. Patti Smith lent real empathy to the most recent piece included this night, “It’s A Dream” from 2005’s “Prairie Wind.” The ubiquity of dream imagery in her own work made the connection deep, while her lullaby reading of the melody proved Young can still write a winning tune, more than 40 years into his career. But the real show stoppers delivered interpretations so radical, they almost deserved a co-writing credit. Babel Gilberto filled out the wisp of a melody in “Harvest Moon,” rendering it ravishing. She also brought a sly eroticism to its lyric of staid romance. Even the percussion in the piece swooned. On the other end of the spectrum, The Roots turned “Down By The River” from a psychedelic rock blow-out to a revolutionary jazz-fusion adventure. Guitarist Kirk Douglas brought great speed and erudition to the piece, with complex fingerings and rhythms wild enough to make your head spin. He, and the band, fulfilled the ultimate goal of an interpretation – to make you both appreciate its original structure and marvel at how it can be made new.